When I first transitioned in to a paleo lifestyle I missed a few things, and ice cream was one of them! But you can thank me later, because I just solved that problem! This ice cream is not only simple, but delicious! You know me though, I couldn't just stop at the ice cream… What about the toppings?! 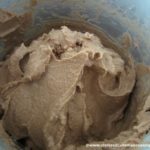 I scream, you scream, we all scream for Paleo ice cream! With simply two ingredients in the chocolate sauce, I bet you'll be making it for more than just this ice cream! Things like my Banana Bread, or even throw it on top some pancakes?! Enough chit chat though! It's time to go have yourselves some delicious ice cream with toppings that will blow you away! Let me know how you like it in the comments below. Enjoy! When you put the bananas on the grill do they go on skin side up or down? Do you turn them?